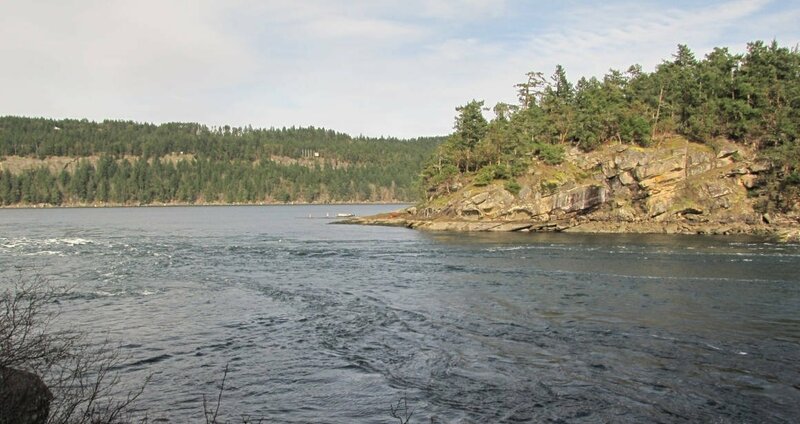 Cable Bay is a must-see for the mid-Island explorer, especially if they will walk the extra kilometer to Joan Point Park at Dodd Narrows — the site of a powerful tidal current. There is a lot of sandstone "beach" to explore here, especially at lower tides. This is a great place to see marine mammals, including orcas if you're extremely lucky. The tidal current at Dodd Narrows creates a unique fishing experience for whales and sea lions. If you want to hear sea lions in large numbers being very LOUD, come here during the right season (I forget when exactly that is...). It's good to see Mudge Island so close, across the narrows from this beach. And then there is Gabriola Island to the left, then Protection Island, then Duke Point and the Harmac pulp mill (in its massive closeness). Would you like to live near here? See homes for sale in Cedar. A well-established trail starts at the parking area and descends gently for a little less than 2km. Then it crosses a pedestrian bridge and emerges above a beach of stone. You can continue to the right, following the shoreline as close to the water as possible, according to the tideline.